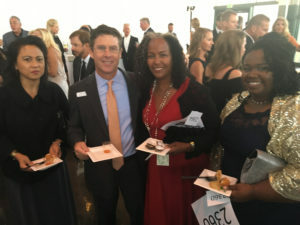 Many of our faculty and staff had the pleasure of attending the Heffernan Foundation’s 30th anniversary celebration as one of their benefiting local nonprofits! The event featured live music from the Lucky Devils Band, 20 open bars, great food, casino games, a live auction, raffle, and more! Heffernan Insurance provides comprehensive business insurance, personal insurance, employee benefits and financial services products to a wide range of businesses and individuals nationwide. Headquartered in Walnut Creek, Heffernan is one of our Corporate Partners and has four of our students associates working in the Human Resources Department in their Walnut Creek office. Thanks Heffernan Insurance for your partnership and support of Cristo Rey.